After a strenuous drive and a short hike on a trail through a forest on Vancouver Island which spills you out onto the driftwood strewn pebble banks of a river, views of a surreal and scenic waterfall - the Virgin Falls, appear before your eyes. It appears like a surreal scene from Treasure Island, a beautiful waterfall surrounded by the scenic and rugged wilderness that Vancouver Island is known for. 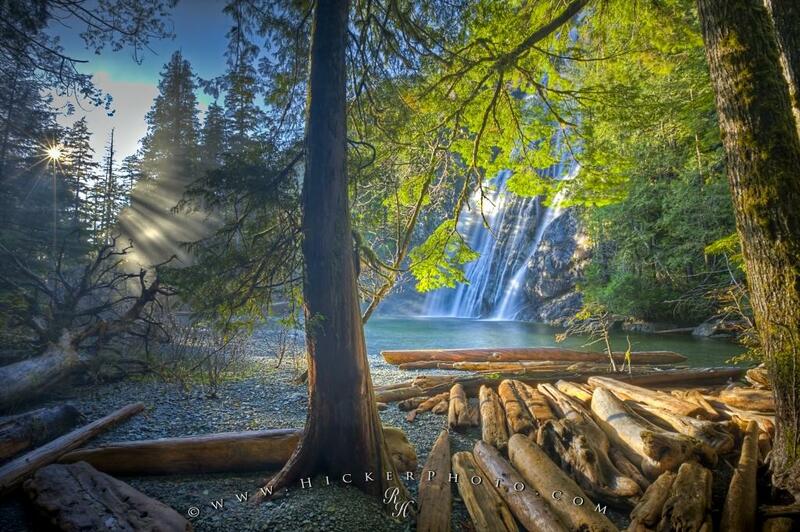 On a fine day it's a soothing scene with the sun filtering through the trees shooting out sun rays in all directions. The scenic Virgin Falls flow over an escarpment of 53 metres (174 feet) height in a fan formation to a crystal clear pool below. The banks of the pool and creek are littered with large logs which have been tumbled and smoothed by rocks and water as they've made their way along the river to their current resting place. Virgin Falls seen from the forest with rays of sunlight streaming through trees, a transition area of the Clayoquot Sound UNESCO Biosphere Reserve, Vancouver Island, British Columbia, Canada. Picture of the scenic Virgin Falls, a surreal waterfall on the West Coast of Vancouver Island seen through the trees.